ONCE MORE WITH FEELING: JULY WEEKEND INTENSIVE IN TORONTO! THOMAS YOUNG & SUSAN EICHHORN-YOUNG OFFER A SINGERS’ INTENSIVE WEEKEND OF VOICE IN TORONTO!!!!! 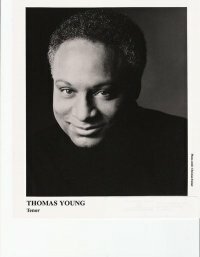 Thomas Young - and Susan Eichhorn-Young will be offering a SINGERS’ INTENSIVE WEEKEND IN TORONTO July 16 - 18, 2010 We offer a combined 60 years of experience on stage and in the studio! Available with Susan Eichhorn-Young and/or Thomas Young. 1 hour in length and can cover YOUR needs - technique, repertoire et al. This is to enhance your studies. These will be scheduled with the individual singer with Susan on Friday and Saturday and with Thomas on Sunday. Length of class: 2 - 3 hours (depending on enrollment) Friday, July 16, 2010 starting at 6 p.m.
Open to ANY singer who is interested in learning more about the singer’s process in jazz repertoire. Each singer will prepare ONE jazz standard to perform. The class will address: time/subdivision/ swing/bebop; language; tonal choices and colours; vocal onsets specific to the style; vowels and vowel groups specific to the style. 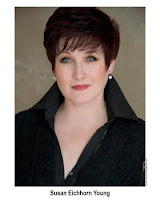 Length of class: 2 - 3 hours Saturday, July 17, 2010 starting at 5 p.m.
Each singer will prepare ONE aria/art song to perform - from the standard opera/oratorio repertoire or the standard art song literature in any language. The class will address access to character in performance; access to process and how you prepare; stylistic choices and decisions; musical choices and decisions. Each singer will prepare TWO contrasting MT song cuts - 16/32 bars. The class will cover HOW you audition - from repertoire to taking the room to what to wear to what to expect. Discovering your type and expanding on it. How you claim your professionalism in the audition and make yourself memorable in a positive way! Auditors welcome. Length of class: 2 -3 hours (depending on enrollment) Sunday, July 18, 2010. starting at 4 p.m.
Each singer will prepare ONE FULL song from the music theatre repertoire. The class will cover character through voice and physicality; types of song; technical and stylistic attitudes - from legit to mix to belt; How to make the song your OWN!! Length of class: 2 hours Saturday, July 17, 2010, 12 noon - 2 p.m. This class will address how to become the CEO of YOU! The class will cover audition expectations and fundamentals and the differences between opera and music theatre; what needs to be seen in headshots and resumes (bring yours! ); introducing YOU - cover letters, emails, follow-ups and how to DO it! find out what you are selling what they are buying and how you make it WORK! No auditors. Everyone is a participant!! DISCOUNTS AVAILABLE IF REGISTERED BY JULY 1ST, 2010!!!!! A $50 NON-REFUNDABLE bank email transfer will be required to complete your registration and will be applied to your total fee. The balance of the fee will be expected at the first class you are registered in and can be paid by cash or cheque. Receipts for the ENTIRE fee will be given. Cheques are payable to “Susan Eichhorn-Young”. NO GST. TO REGISTER: email susaneichhornstudio@gmail.com SUBJECT LINE: JULY INTENSIVE Please indicate in the email what you want to register for! If you want a private session, indicate WHO you would like to study with (Susan or Thomas) and if you have a preference of day/time.